To this day, mum and grandma still believe that us curvier girls should not be sporting stripes because they make you look bigger than you actually are. If a year ago you told me that I would be head over heels for anything stripy, and I mean anything, I would have shrugged the comment off and called you mad. Now, tables have turned and I can’t get enough of this stuff. Whilst shopping today on good old ASOS (they have a 50% off sale currently btw), I noticed a LOT of stripy camis, dresses and pants in sorts of weird and wonderful combinations and it hit me, STRIPES are definitely back and here to stay with us through spring and summer. It’s not been long at all that I've brought a simple yet cute stripe outfit to the blog (see S/S 2016 Trends: Stripes & Cropped Flares) and talked about how trendy this linear combination is. As spring/summer approaches, it is time so start considering new-season styles and if you too think stripes make you look larger and wider, think again as there are styles out there that are more than flattering to any body shape. Whether they are vertical, horizontal, or a mix-match of both, stripes are very in and the new collections both on high street and designer are bursting with seafaring stripes of all shapes and sizes, for ALL shapes and sizes. And what can I say, I am LOVING them hence the second stripy outfit of the season (and I'm sure I won't be stopping there). This time round I chose an OFF SHOULDER top because not only were they key pieces last summer (see S/S 2015 Trends: Off-The-Shoulder Dress & S/S 2015 Trends: Wedding Guest Dress), they make stripes extremely versatile and easy to pull. The off shoulder look became ubiquitous on the spring/summer 2016 catwalks, from Proenza Schouler to Creatures of the Wind, and has now begun its high street ascent. They make me feel feminine and truly spring-ready. 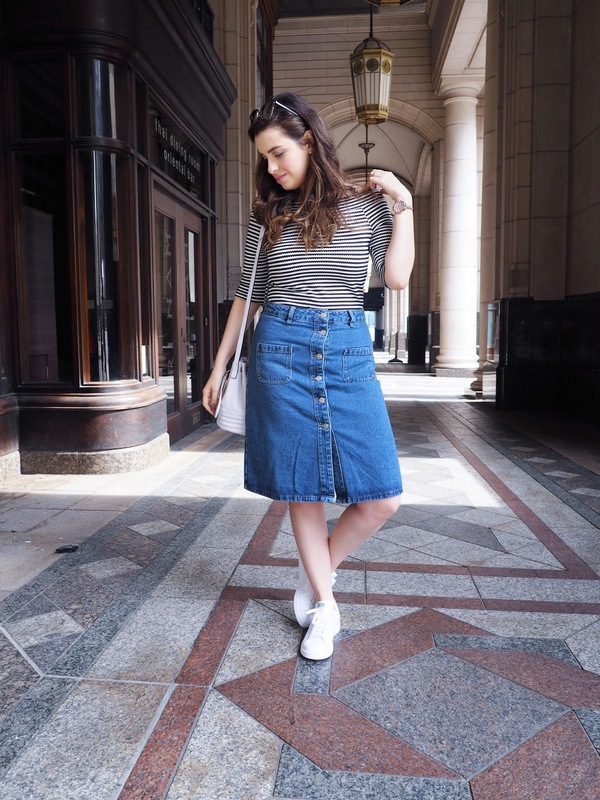 The BUTTON-DOWN skirt has been on the scene since A/W 2015, thanks to the influence from the 70s, as denim being a must have in every girls wardrobe. 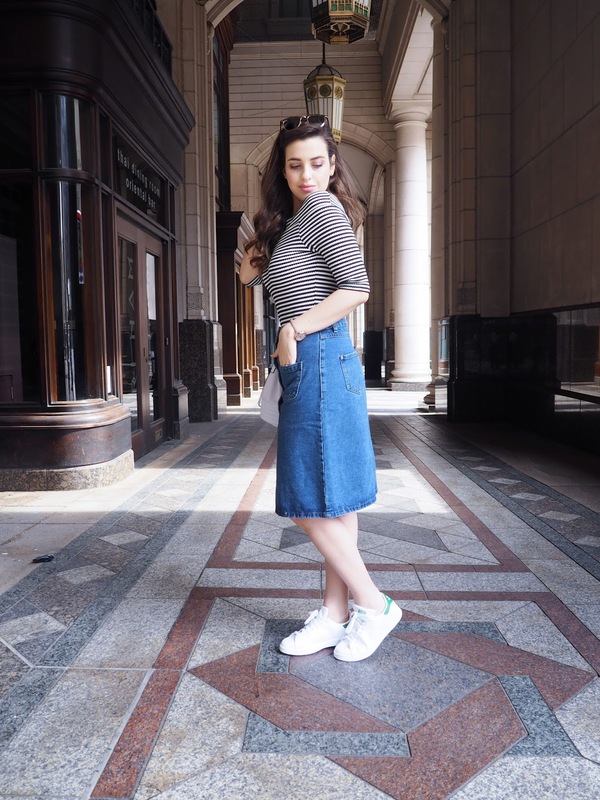 A button-down denim skirt is not only a fashion item, but a wardrobe staple, being pretty much appropriate for any age and any season! I chose mine in a-line mid form for a very casual feel and polished off the look with white accents. What do you guys think of this super casual look? Perfect for a spring weekend don't you think? You looks so pretty darling!! Love your outfit soo much! You wear whatever the hell you want, Pam, because girl, you be slaying in stripes! I'm LOVING that top on you; it combines two of my favourite things -- stripes and off-shoulders! I Lovvvvve the off the shoulder trend too. And I've been craving those Adidas too!! Love this outfit! No kidding about the old tale about stripes making us look wider, my mum still believes that too. LOL! You look great, Pam! 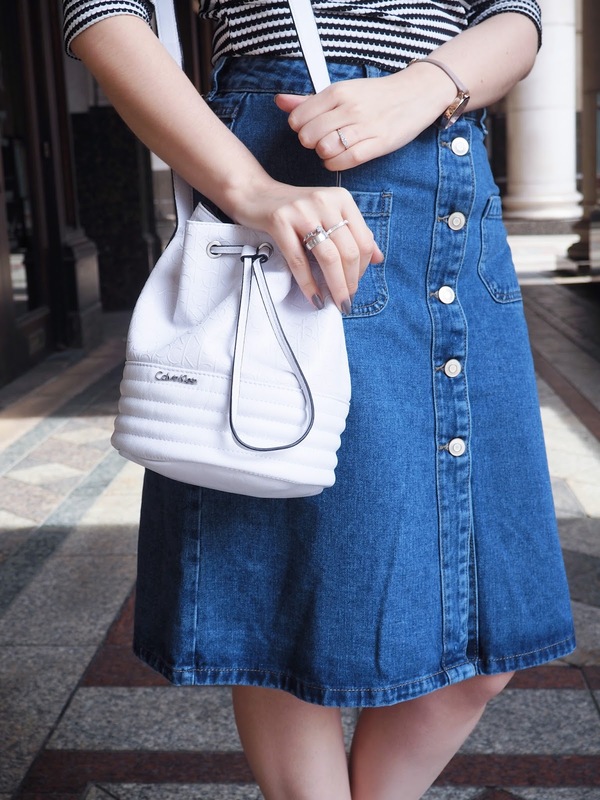 So in love with that bucket bag! You look stunning in stripes. Love this retro look on you! You look great hun! Love the look and that's it all from Matalan. Haven't shopped there in a while; need to pay a visit. Where is that place that you are taking your photos? It look familiar. You look amazing missy! Absolutely loving this Spring combo. Matalan look like they have the perfect pieces in ATM! Love the stylish look, Pam. Such a cute outfit Pam! Love stripes and denim! How do you find such nice stuff in Matalan! Stripes are my favorite pattern, curvy or not <3 It's a gorgeous top on you and the off shoulder is such a beautiful look, you look stunning in this outfit!!! I love the whole outfit Pam! Thanks for your wonderful comment on Qing's Style Please keep in touch! That top looks great on you, Pam! great style! i love it! Oh so chic look Pam. You look amazing hun! I adore the skirt so much, it's really pretty! I love the top also, it's so cute I must get one! Such a great style, love it! Bonjour from France, Sand. I absolutely love this outfit, and I'm really loving that stripped off the shoulder top. It just looks effortless, yet stylish at the same time. Cute outfit I love the stripe top very nice. Lovely outfit that striped so cute you look amazing. Love this casual look! The sneakers are dope! Such an beautiful look ! 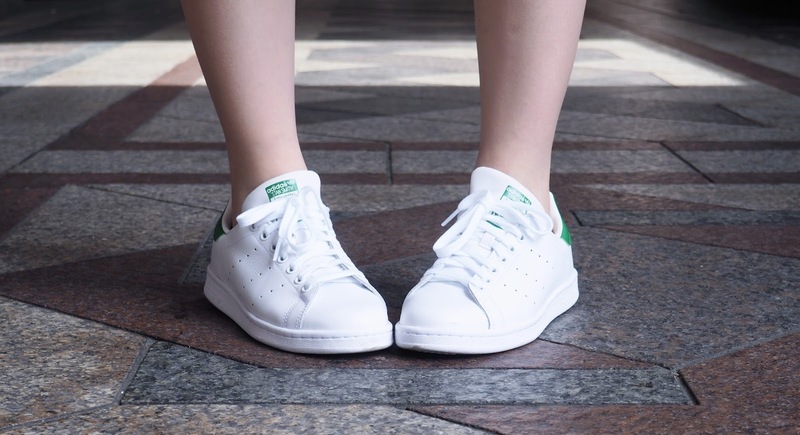 I love your stan smith shoes and your bag.